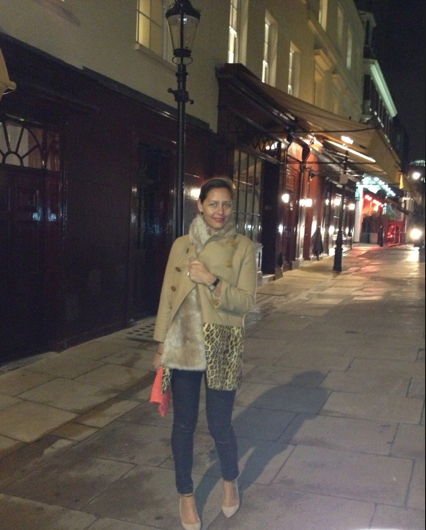 Above is a picture of me, taken by my twin sister, a few nights ago outside 5 Hertford Street, London's newest members’ club. The exclusive Mayfair establishment was founded by Robin Birley, the former owner of Annabel’s. To say the club is ravishingly elegant would be an understatement: it features several sleek bars, dining rooms and a basement nightclub called Loulou’s--the jewel of the club (think Tony Duquette, Oushak rugs, tribal-deco decor). One of the bathrooms is lined with mother of pearl! And the people there (I spotted Tommy Hilfiger, Jemma Kidd) were dressed to the nines. I sported some new fall pieces (my Wren coat), but accessorized with tried-and-true: my red Clare Vivier clutch. Seriously, this bag has gone everywhere, from Capri to Montauk and now Amsterdam as I write this, and that's because it just about goes with everything, anywhere and adds some punch to any outfit! Just found your blog by way of a Tumblr site that had a photo of a bookcase in your home. I was so pleasantly surprised to see you in a coat I've been thinking of buying. It looks so gorgeous on you--has just the right amount of leopard. Thanks for posting. You look great, as always. I love Clare Vivier! You look gorgeous! Love the coat, the shoes, the clutch. hi! love this look! where is your faux fur scarf from? love the color. also are you wearing a size small in the combo coat? thanks! And I am wearing a size small in the coat.